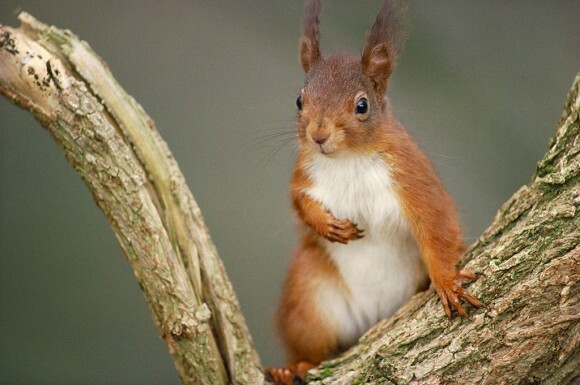 Red squirrels are a reddish brown colour all over, apart from their underparts which are creamy white. They are smaller than grey squirrels and have distinctive ear tufts, although these are more pronounced in some individuals than others. They have a long, bushy tail used for balance. Red squirrels weigh between 280 and 350g and are 20-22cm long with a tail length of approximately 18cm. Red squirrels prefer mixed woodland, with a good mix of both deciduous and coniferous trees. They are found across much of Europe, Russia and Asia, up to altitudes of 2000m. Within the UK 75% of the population is found within Scotland, where there are still regions that grey squirrels have not yet managed to invade. Red squirrels eat a variety of foods. They consume the cones of most species, picking out the nutritious seeds inside. They also eat nuts, fungi, flowers, buds and fruits and will occasionally take insects and bird eggs. They do not hibernate in the strict sense of the word; rather they lay down stores for the winter and wake up from their sleep periodically to feed. Each squirrel will have several caches, which, due to their excellent sense of smell, they are able to locate even under one meter of snow. However, they are not able to remember where they have buried food and many caches are never found again. They spend most of their day foraging and feeding. Red squirrels build dreys high in trees. These are hollow balls of twigs and leaves, lined with moss and other soft materials to hand, e.g. sheep wool. They breed twice a year, usually in March and July, producing litters of 3-4 (maximum six). The gestation period is 38-29 days. Squirrels are not monogamous and mate with numerous partners. The kittens open their eyes at 30 days old and first leave the drey after about 45 days. At 10-12 weeks they become independent and disperse from their natal site. Red squirrels are categorised by the IUCN as ‘Least Concern’ due to their wide range and generally stable population. However, within the UK the species has suffered major declines and is classed as ‘Threatened’. They face a number of major threats, the most serious being competition from the non-native American grey squirrel (Sciurus carolinensis). Grey squirrels are larger and more able to digest large seeds from broadleafed trees, e.g. acorns, so easily out-compete reds. Another major threat is squirrelpox. Grey squirrels are carriers of the virus but are immune to it, whereas it is fatal to red squirrels. It causes legions around the face and genitalia, discharge and lethargy. Affected squirrels normally die within two weeks. 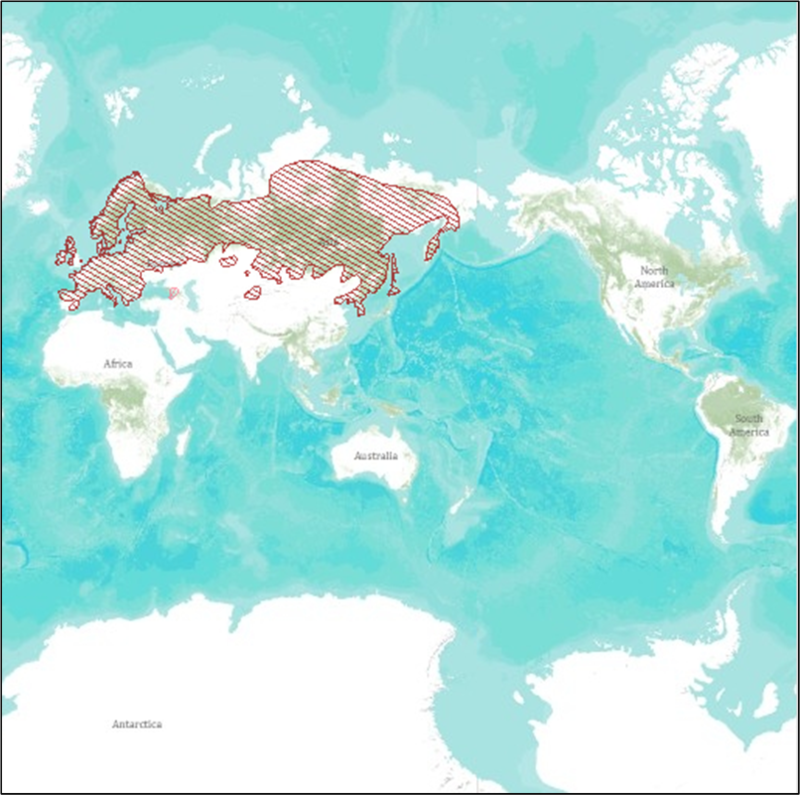 Habitat destruction is another major problem, with a large majority of mixed deciduous woods felled and replaced with sitka spruce plantations. Many red squirrel populations are now small and fragmented. Red squirrels are listed on Appendix III of the Bern Convention and, in the UK, are protected under Schedules 5 and 6 of the Wildlife and Countryside Act. They are a UK Biodiversity Action Plan priority species.